Having: mostly enclosed UM chamber for better prints. The new beta Cura fails hard on me, aside of being a good 2-3 times slower in calculation the print results are horrible. I am not even able to print the ABS raft, I've heavy wrapping of the second layer without bonding. At exactly same settings (also tried standard settings) as on the standard cura. 1) There is a print speed setting in the standard expert tab, does it have ANY influence ? I found a lot of print speed settings in the Advanced tab that seem to have influence. 2) Is it possible to set temperature in Cura ? In the new cura I could set it without effect, in the old one I can set ABS/PLA in simple version but not in expert mode and it seems to have no influence. Is it only defined by printer settings ? 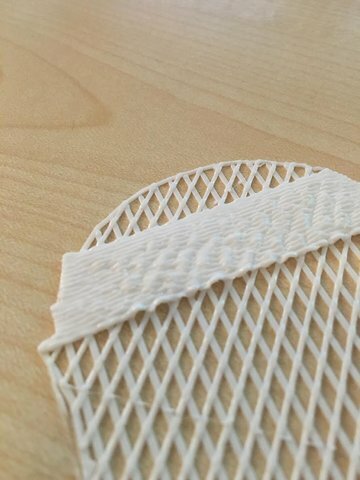 If so, how to print the first layer hotter than the others!? I tried it in new cura and the temperature was completely ignored. The ultimaker starts to print a string of filament in front left corner, then it moves to the print dragging that string of "crap" behind it and often moving it into the model/raft/brim causing a failure. The best solution I found so far is to just let it flow on the side and then hold it when the print starts, that causes it to break off or get very thin and not causing issues in the print. Without manually doing something it ruins a good 80% of all prints. I'm still using Cura 14.09 but the same issues seem to exist. It appears to have something to do with the way expert mode is implemented. The expert tab seems to undo the defaults that are automatically set using the Quick print mode, or perhaps it fails to set them. Whenever I use expert tab I get a spew of crap because it doesn't stick to the plate. My guess is that it is the starting bed temperature not being set in the g-code instructions. My only reason for using expert mode in the first place was to simply set the fill to 100%, but ended up not being able to print anything. My solution was to generate two g-code files: 1. using Quick print and 2. using Expert mode. I then copy the header from the one that works (Quick print generated) and replace the one in the g-code file that doesn't (generated with Expert mode). The Expert mode file has the path I want with the 100% fill. I then stream the g-code to the printer using gcode-sender.exe ...It works great! Too bad the Cura environment isn't a little easier, or maybe it is my bad because there is some version with the fix and I'm not aware of it. If someone knows what's going on here I'd love to know the right solution also. The expert tab seems to undo the defaults that are automatically set using the Quick print mode. Yep. Cura 2.1 does remember it.